I would like to respond to this email I got today. 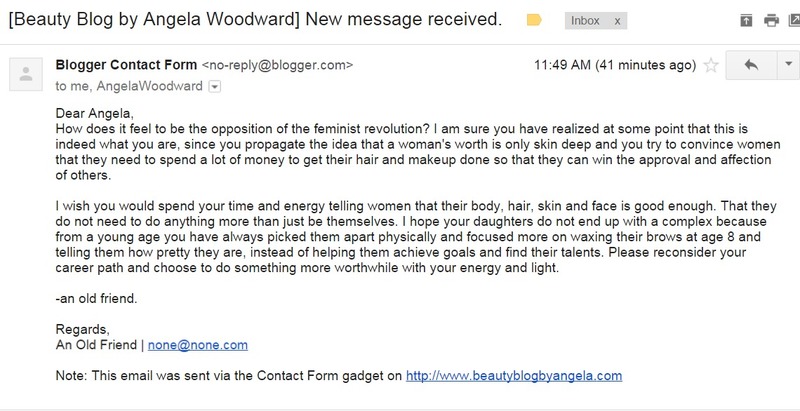 On my blog there is a function where anyone can write into me to ask beauty questions and let me know what they want me to post about. Whoever wrote me this letter chose to go through that function using a persona instead of a name and a fake email address. I have no idea if I have ever met this person before, but since they signed it “an old friend” I would assume I have. Hopefully they are my friend on Facebook too. First I would like to say that I hate that old saying “if you don’t have something nice to say, don’t say anything at all.” I think it is important to talk about what is going on in the world, your life and to council your friends, good or bad. Change does not happen by only saying positive things. However, you should reconsider voicing your thoughts if you are not willing to own up to them, and admit that this how you feel. The internet has made it super easy for people to hide behind personas and computers and attack people they know (or have never met) from the comfort and safety of their couch. It is called Cyber-Bullying. Second I would like to give you some clarity about what it is that I actually do. I celebrate people. I help them feel good about themselves and confident. I listen to them tell me stories about their lives and I grow to care about them. I have cried with the guests in my chair, I have opened myself up to them and I have hugged them. I have befriended, I have helped and I have walked with them through periods of their life. I watch them struggle and battle with loss, illness, divorce, choices, unemployment, the choices of their loved ones and more. I am a relief for them after a long hard day of work, where they get to chat and relax and get away. I am the guaranteed 3 hour break a new mom gets every other month where she can look in the mirror and remember how beautiful she is outside of the spit up and diapers. I am the person who helps a young girl who has struggled with loving herself her whole life look in the mirror and feel beautiful for her wedding day. That is what I do. I would now like to address some of your specific beliefs about what I do. The first being that I tell people they have to spend a lot of money so that others will approve of them. That is not what I do at all. People ask me all the time “What shade am I?” and “Will that work for me?” Rarely do I actually tell them that they should reconsider a lipstick or a hair color. My response is usually that they should do what makes them happy. If they want red, let’s do red! Hair styling and makeup artistry is not there to make others like you, it is here to help you feel confident and beautiful. So who cares if that lipstick is your shade? Do you love it on you? Then buy it! I am an artist, I accentuate beauty and I bring it out in men and women. I help other people discover it in themselves. On days where I sit around and watch tv and do some light cleaning I do not feel motivated or accomplished. On days where I wake up late and have 15 minutes to get ready and run out the door to work I do not feel energized or powerful. When I look in the mirror and I do not like what I see I do not feel ready to ask for a raise or to go for a promotion. However on days where I wake up and I take time (usually about an hour total) to take care of myself and groom myself and invest in myself, and when I finish I feel beautiful and confident, those are the days I get stuff done! I help people have those days, those weeks, those months! I help people find the confidence to say yes, I do, will you and no! I help people love what they see when they wake up in the morning and that is powerful. The last thing I am going to address is the incredibly rude comment you made about my future daughter having a complex. First of all, how dare you make a judgement about my parenting, when I don’t even have a child?! How asinine can one be? Second I hope I have a daughter in the future. I hope I do so that I can teach her to be smarter than me, and to dream and to dance and to laugh and to love fiercely. I want to teach her to have an open heart and to love those who do not want it, and to try to understand those she is having a hard time loving. I want to teach her to stand up for herself and to fight against nay sayers, and bullies. Most importantly I want to teach her to know herself so well that when cowards like you come out and try to define her and tell her who she is, she doesn’t even have to blink before knowing that you are wrong and continue on her path to happiness and success.